Enhance the aesthetic appeal of your home's interior with attractive tile flooring. 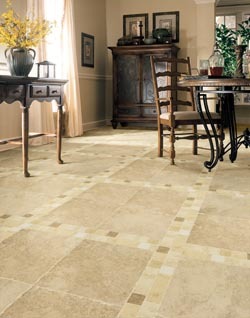 Our flooring store boasts an impressive selection of tile floors, including Glazzio Tiles, Marrazzi, and Happy Floors. Our ceramic, porcelain, and slate tile choices are extremely versatile, giving you both beauty and functionality at an unbeatable value. Let us know if you require tile floor installation. For your added convenience, we can package the installation service as part of your flooring purchase. Backed by many years of experience, our flooring experts are ready to help you find the perfect tile flooring for your unique needs. We have in-depth knowledge of all our tile floor options, so you can count on us to answer any questions you have about a specific style. Our team also has extensive experience with flooring design. Bring us your interior design plans and we will help you choose the perfect tile to match the interior of your home. Tile floors are the preferred flooring material for bathrooms and kitchens with good reason. They are an extremely strong and dense material, which makes them highly resistant to scratches, dents, and stains, as well as water and other liquids. New floors can transform a space, making it look high end and one of a kind in no time. When you're looking for quality tile, look no further than our Floorcraft collections. A leading manufacturer of ceramic tile, Floorcraft offers an extensive variety of selections, which include options to suit anyone’s aesthetic preferences. Choose from classic to contemporary and anything in between. Put simply, whatever your style, Floorcraft is sure to have tile flooring that complements your personal preferences. Floorcraft offers much more than provide of ceramic tile floors. The company also offers beautiful porcelain tiles. Versatile and durable, these tile floors are the perfect addition to any home that requires a hint of elegance and sophistication. Shop the entire selection by visiting our local store to find just what you seek. If you're looking for tile flooring with a natural look, nothing compares to the strength and durability of slate tile. Slate is known to last long and look great for many years to come. In fact, it's strong enough to maintain its pristine appearance in busy households with kids and many visitors. Most well-known for its strength, slate tile has a number of other advantages. Some floors require extensive maintenance to keep up their perfect appearances. However, slate is easy to maintain. Simply wipe up spills and sweep it once per week to keep your floors looking like new. Be sure to add padding to furniture to prevent your slate tile from scratching. Finally, slate is water and stain resistant. That's why it's one of the only flooring types you find inside and outside. In fact, many homeowners install this in kitchens and bathrooms, as well as on driveways and around pool areas. No matter where it's installed, slate tile is sure to impress. Allow our flooring experts to help you make the right decision. We have in-depth knowledge of all our tile flooring options, so you can count on us to answer any questions you have about a specific style. Our team also has extensive experience with flooring design. Bring us your interior design plans and we will help you choose the perfect tile to match the interior of your home. When you choose us, you can expect our on-staff technicians do much more than complete every tile floor installation with speed and skill. To ensure the complete satisfaction of our clients, we back our installations with the Ultimate Confidence Guarantee, our unprecedented warranty. We promise that if you are unhappy with any aspect of your new tile and you contact us within 30 days of the tile floor installation, we will replace it with another product free of charge. We even pay for the labor. Amazing warranties, quality products, and unbeatable prices--what could be better? Discover why homeowners throughout the area continue to make us their only source for tile flooring and more. You will be glad you did. Contact us today with any questions about a specific tile flooring style you desire. We proudly serve Minnesota City, Winona, Goodview, Buffalo City, Dodge, and the surrounding areas in Minnesota, as well as Arcadia and Galesville, Wisconsin.